"Hard to put down, stopping no place for very long yet honed in on one . . . cathartic theme: how to defeat social and political indifference when fear and self-loathing are the engines of the economy itself. This is one of the most eloquent recent poetic works to cover the downsides of 'progress' and to cry out for a counterpunch against the manipulations of empire." "Outrageous and outraged, this book challenges the fear and greed that are destroying our world. Read it and respond." "An epic, visionary, kaleidoscopic treatise/poem that, amazingly, attempts to make sense of and show a way through the rich madness of our time . . . Partly wail of pain, partly ode to nature and human spirit, partly a last-ditch effort to consciously click back to a sustainable pathway, this book will leave the reader simultaneously exhausted, enlightened, depressed, and exhilarated." "Michael Brownstein's text (combination Jeremiah, Milton, Blake, and sci-fi horror movie) is a blueprint for the first real revolution since the Neolithic." A poet's impassioned, prophetic examination of corporate globalization, World on Fire moves back and forth between the present and a vividly realized post-apocalyptic future. 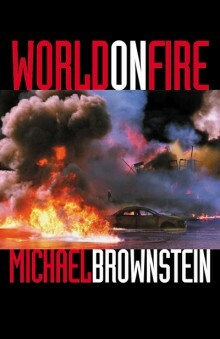 Brownstein examines the mindset of unrestrained ego and ruinous competition that informs our culture. He shows how self-aggrandizement has led to disturbing developments in biotechnology and genetic engineering. He reveals the economic, environmental, and psychological consequences of transnational capitalism, where drug addiction equals petrochemical addiction equals global capital's addiction. But the book also carries a message of hope. It looks to tribal models of community in order to understand the folly of defining ourselves in terms of power relations. A deeply personal book, World on Fire combines narrative, poetry, and social analysis in a new nonfiction form. It draws on the work of many contemporary writers including Noam Chomsky, Eduardo Galeano, and Vandana Shiva. Manifesto and call to arms, Michael Brownstein's World on Fire offers a new perspective, encouraging us to move past ego's limited agendas and create a new life. Michael Brownstein is the author of three novels, Country Cousins, Self-Reliance, and The Touch, as well as several collections of stories and poetry. His fiction has appeared in The New Yorker, The Paris Review, and other magazines. He taught at the University of Colorado, Naropa Institute, and Columbia University. In recent years, he has become involved in the worldwide anti-globalization movement, traveling to Ecuador where he observed first-hand the petroleum industry's destruction of the environment and indigenous cultures. He lives in New York City.